A good friend and collector sent me this photo from her iPhone last week. 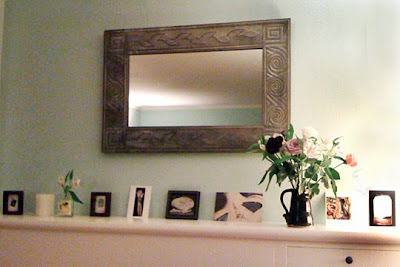 I was touched to see how she has arranged on her mantle postcards of my art with the three collages she owns. Pictured here left to right are two small-scale collages from the Milagros series, a postcard of Creative Fire Within, the collage In Memory from Mapping the Body, and postcards of Flight, Evocation #001, and Sanctuary #1. This photo was such a great reminder that my work exists and lives beyond me. It is easy to forget when I am working away alone in the studio that my art is out there enriching the experiences of others. I am so grateful to Nell for the gift of seeing how my work is installed in such a graceful and beautiful way in her home.